Took it to the Sky for Yelp — Let’s Make Food Babies! So when Yelp asked us if we’d grace the floor for their first ever Los Angeles Open Party, we thought…sure. Our original request was for them to allow the entire coordination of the event (located at the Jlounge Restaurant and Nightclub in Downtown LA) to be our responsibility. Apparently, they we’rent “comfortable” with that, so we accepted the challenge (per request) of turning the entire outdoor patio into an “Air” inspired party environment. 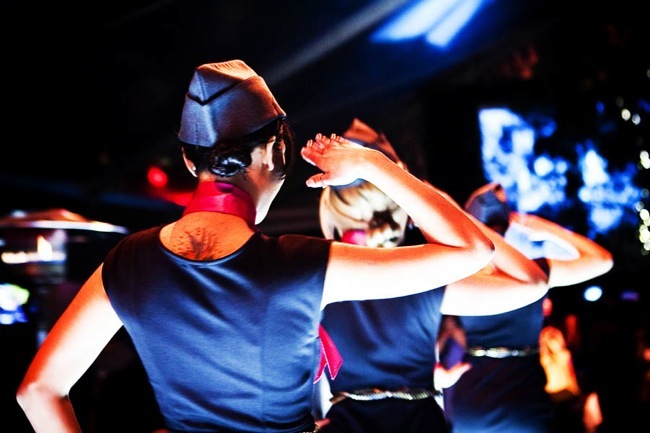 So we had our cocktail waitresses dressed in custom A12K flight attendant gear as DJ Armen Abajian was decked in a full A12K captain outfit. Armen spun the hottest in electro house & progressive music from his cockpit style stage setup in front of 144″ projection screen. The video featured the prospective of a flight captain flying through blue skies and clouds. It was f**king rad. He straight killed it on the 1s and 2s as expected from the Minister of Sound. So instead of having the classic coffee and cookie airport booth, we went with a “Coffee Clinic” concept. 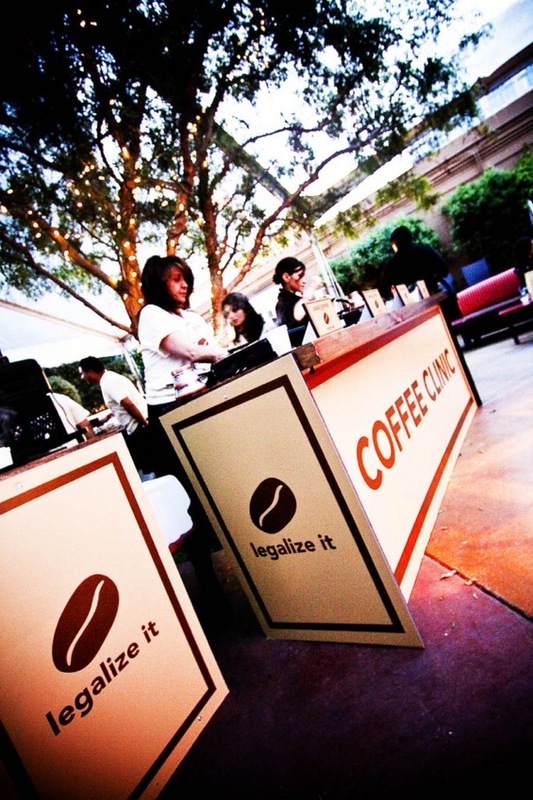 Assuming coffee was an illegal drug (versus a legal one as it is now) we served coffee as would a coffee healing center. Filtered coffee, un-filtered coffee, coffee brownies + crisps & even 1/8 oz and 1/4 oz prescription bottles of coffee (as seen above). 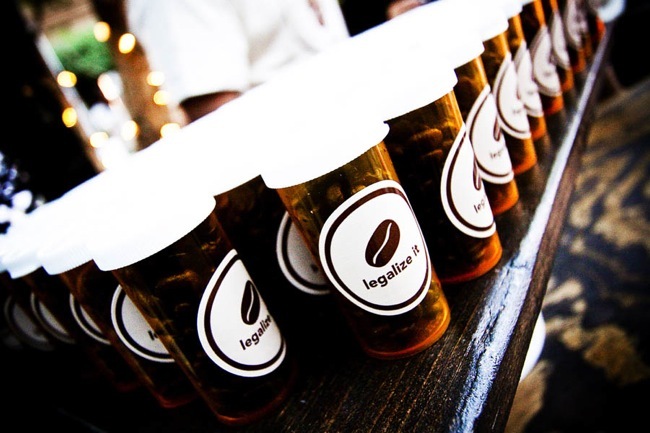 The “legalize it” campaign subliminally hinted the theme throughout all articles at the station. The unfiltered coffee (whose potency was the highest) was an absolute hit. It played the role of master kush for the night. Rastaman Nick Joseph educated guests on how and when to use the various coffee products. Fly high, that’s the motto. 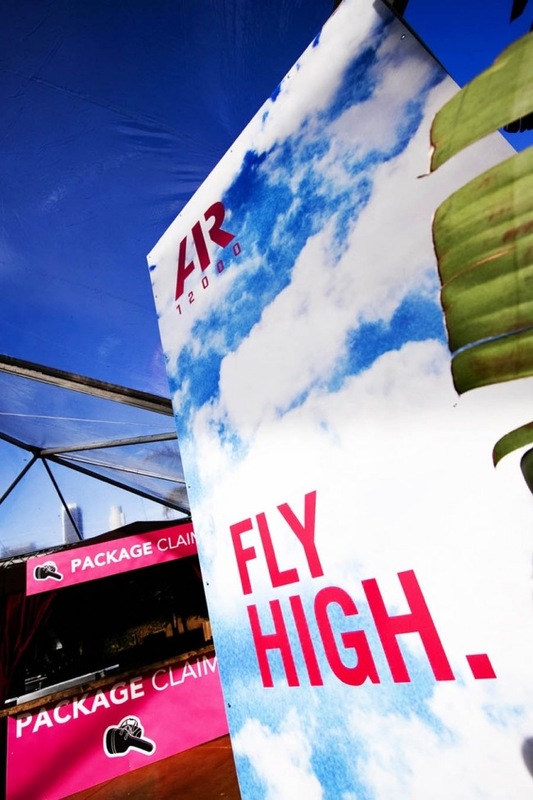 Over 1,500 guests came through the spot, rounded the stations, and sampled all that Air12000 had to offer. People we’re tripping, asking “what is this? I don’t get it.” A good sign, as we see it. Lady Meline performed endless life vest safety performances in a G-Rated Stripper/Gogo Dancer fashion – all while shining the brightest in brite-whites. I mean s**t, we had our flight attendants putting on a show all night. Catwalk style…over and over. Sometimes with food, other times with drinks, and most of the time – just strutting their stuff. A kiss goodbye. 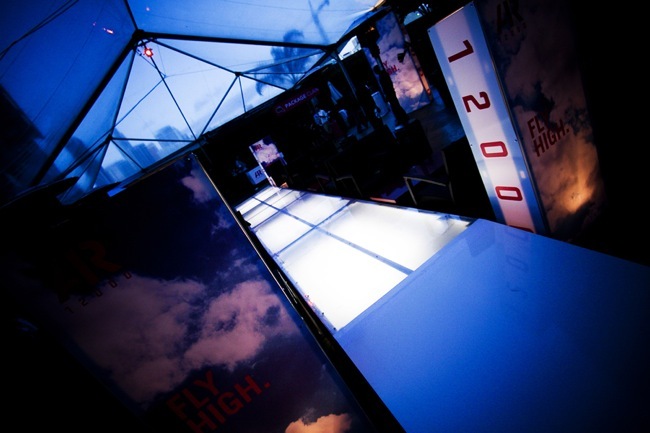 Air12000 was a one time effort specifically designed for our friends at Yelp. K12 = Never duplicate, sometimes re-create, always innovate. Visit Air12000.com for more photos and a step by step creative timeline for the party’s inception.